how can i help parents understand and respond effectively to their children? The answer to this question lies in helpers facilitating the construction of common knowledge between parents and their children, and the use of this common knowledge as a resource to mediate their interactions. The fifth pathway for expertise looks at the specific expertise and skills involved in helping parents attune to, understand, and respond to their children. Key to this is enabling parents to discern what matters to children, when this is often unclear or hard to figure out. This is based on the same Vygotskian concept of common knowledge as the section on what matters between helpers and parents, and is thus from the same family of ideas as the zone of proximal development (used in effective challenge), and double stimulation (used in escaping impossible situations). Readers are encouraged to read the what matters (helper-parent) section before this one, as the idea of common knowledge, and distinction between what matters and goals are also highly relevant here. One way in which impactful partnership comes about is by helping parents understand what matters to their children. In the process, what matters to the parents often changes too. The motives of the parent and child are revealed in a way that means the parents’ actions can be refocused to better support the child. The means of doing this vary depending on the age of the child, the issue in focus, and the kind of service. In all cases, helpers used their expertise to help parents understand what matters to their children. It is not always obvious or clear what matters to children: they can send mixed, confusing or even apparently contradictory messages - even older children, not just pre-verbal infants who don’t have words. Making what matters to the child visible to parents can be the basis for significant changes in parents’ capacity to provide the care and nurture they wish for their child. This is a mind-expanding process in that the ways of making sense of the child are multiplied (expanding interpretations), and these then form a new basis for interacting with the child (expanding actions). The common knowledge (see concept box on helper-parent section) between parent and child that emerges through this kind of intervention is both a tool used to work on immediate and recurrent parenting challenges, and an outcome of impactful partnership. This common knowledge is itself a result of productive entanglement between the expertise of the helper and the knowledge, actions and situation of the family. It can be understood as a small thing with a big effect in the sense that a particular insight into what matters to a child can lead to significant changes in many parent-child interactions and in turn lead to changes in a child’s developmental trajectory, parents’ confidence, and broader family wellbeing. Each time, the parent’s attention shifted from a task focus to a focus on their relationship with the child and making the experience positive for the child. Mediation is a key concept in Vygotsky’s original works  and in much contemporary research that is inspired by his ideas . It helps to think first of someone working on a problem, like how to remember a set of related ideas. This could be the five features of special play that are an important part of parent-child interaction therapy . Working directly on this is hard. However if a mediating tool is used then it becomes much easier. In this case the ideas are pulled together in an easy-to-remember mnemonic ‘PRIDE’ (standing for praise, reflection, imitation, description, enjoyment). The problem of remembering is re-directed via ‘PRIDE’. The parents’ attention is less focused on the problem of remembering and more on the means to the solution. Mediation is the term used to describe processes where a tool is used in this way. The tool can be something physical or an idea. Just as in the case of what matters between helpers and parents, this process works by creating a new resource (common knowledge) that changes the way two (or more) people work together on a complex problem. In this case it is the parent and the child working together on issues like sleep and settling, breastfeeding, transitions to solid foods, managing behaviour, and so on. The process works on the assumption that the key to supporting children when there is some difficulty is understanding what matters to them. The diagram illustrates the key ideas. A parent and child are working together on a shared problem, like learning to sleep or feed. 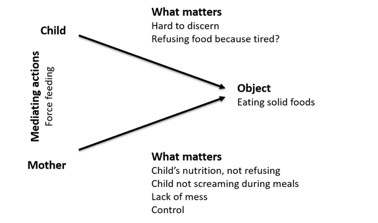 What matters to each of them is not the same (hence they are shown separately on the diagram). If the parent understands what matters to the child, then common knowledge can emerge as a useful resource. It can enable the parent to interact with and respond to the child in a way that meets the needs of the child. In doing so the parent is showing the child she is in tune with what matters to them both. This particular aspect of impactful partnership requires a special set of knowledge and skills on the part of the helper. Helpers have to interpret a situation and consider possibilities for what matters to the child. They also need to find out what matters to the parent in this situation. They then have to help parents understand what matters to the child. This may involve some joint sense-making between the parent and helper, as the parents’ knowledge of her child and her past experience in similar situations might provide crucial clues as to what matters to the child. This is an example of productive entanglement. Once a tentative and shared understanding of what matters to the child is reached, the helper needs to support the parent in using this as basis for acting differently. This may include making new connections with familiar actions, or developing the parents’ repertoire of ways of responding to or interacting with their child. All the while, the helper needs to check in with the parent and ensure the whole process is proceeding in a way that is acceptable (see what matters: helper parent). Parenting is always a matter of understanding and responding to this child in this situation. What matters to a child is often hard to discern. A child may fuss and cry while breastfeeding even if they are still hungry; she may appear to resist sleep even though she is tired; he may push a parent away during a tantrum even though his preference is for a warm relationship and he needs help to calm down. Common knowledge between the parent and child helps shift parents’ attention from the task or problem to the relationship, the child’s experience, and the solution. This is not just about parents being able to empathise with their children (although that is clearly important). The reason that common knowledge between parents and children functions as a small thing with big effects can be understood by connecting it with the Vygotskian idea of mediation (see key concept box). 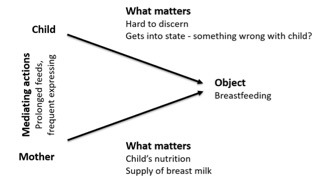 In the initial situation when parents experience struggle in some aspect, their focus is often on the task (of breastfeeding, settling, controlling behaviour etc. ), or on the problems associated with these tasks. In the new situation when what matters to the child is made available as a basis for expanding interpretations and actions, parents’ focus shifts onto the relationship with the child and the child’s experience of a particular activity they do together. This redirected attention is oriented to the solution rather than staying fixed on the struggle. As a result of this, what matters to the parents may change from aspects that are elusive (like the amount a child sleeps) to things over which they much more control (like creating a safe sleep space). This can have additional effects, further building parents’ confidence. Enabling parents to understand what matters to the child enables a shift from the helper translating for the child (meanings that were hidden in plain sight) to the parent being able to hear the message and understand where it comes from. Two examples are provided below, each accompanied by two versions of the diagram, representing the ‘before’ and ‘after’ situations. This is a novel but important way of understanding what happens in impactful partnership. I'm worried, how much is she actually getting? Mary experienced significant problems feeding Siân, right from birth. She attended a day stay when her daughter was nine weeks old. What mattered to Mary was making sure Siân drank enough breast milk. What mattered to Siân was hard to discern. She gave confusing messages about being hungry and tired. Mary was feeding for long periods, and they were both becoming upset as this went on. This is represented in the ‘before’ diagram . Hilary explained that Siân was having to cope with a transition from passive feeding in the womb to having to put in effort at the breast. She used her expertise to watch and listen during feeds, teaching Mary how to look out for signs Siân is getting tired or full. Hilary also suggested that being relaxed matters to Siân, so they set a time limit on each feed to stop it becoming too much for the child. Breastfeeding became a positive and relaxed experience for mother and child. This successful change hinged on the nurse helping the mother understand what mattered to her child, and align her actions to that. This is represented in the ‘after’ diagram. Now if she gets stressed, I just stop. I don't persist because it's not fair on her. When she's refusing, I'm upset and I try to push her to eat. Ching attended a Circle of Security  course, wanting help with Fia’s transition to solid foods at seven months old. Previously, she had been force-feeding Fia, and both of them had been getting upset during mealtimes. This is represented in the ‘before’ diagram. Two nurse facilitators helped Ching understand Fia’s behaviour as a form of communication. Ching learned how to apply ideas of being ‘bigger stronger wise and kind’ to mealtimes. She began empathising with Fia, naming her emotions out loud, and giving Fia more say about how and how much to eat. The new situation is represented in the ‘after’ diagram. You have see the child's need. Then when necessary, you have to take charge. The main worksheet (ready to print on A4 or A3 paper) is designed for practitioners to reflect on their practice. There is also a version that you may find helpful to use in your actual work with families - this contains the main figure and some key prompts. Wertsch, J. (2007). Mediation. In H. Daniels, M. Cole, & J. Wertsch (Eds. ), The Cambridge companion to Vygotsky (pp. 178-192). Cambridge: Cambridge University Press. Hembree-Kigin, T. L., & McNeil, C. B. (1995). Parent-Child Interaction Therapy. New York: Plenum Press. Powell, B., Cooper, G., Hoffman, K., & Marvin, R. S. (2016). The Circle of Security intervention: enhancing attachment in early parent-child relationships. London: The Guildford Press.